Enterprise design, dedicated and experienced engineers, cloud flexibility. Please contact us any time for answers. Coeus Blue Magento hosting is designed for successful ecommerce site owners ready to move beyond small dedicated or shared hosting. Our managed magento hosting solution is a turn-key option for your ecommerce site. When there are issues with your site our engineers take action, and contact you about the incident. No more sitting on hold with waiting for call center representatives who know nothing about your site and nothing about your business. Our Magento hosting offerings start with all-in-one dedicated instances and run up through enterprise clustered designs without any single points of failure. If you are are ready to stop spending your time managing your website, and get back to running your business give us a call today at 866-847-8171, email us, or reach us on twitter @coeusblue. The Coeus Blue Magento Enterprise hosting environment has been engineered to meet the demands of modern high traffic eCommerce sites. We have made extensive modifications for security and performance to ensure the best performing, most reliable Magento hosting on the web. Fully managed Magento enterprise hosting means that you have a live engineer to customize and support your environment to meet your needs. Performance - NginX webserver providing performance greatly surpassing both apache and lighthttpd. In fact Varien, the producers of Magento Enterprise, moved their own demo store to NginX. php-fpm lets us separate your application code from your static assets such as images. Mysql has been tuned to for Magento's mixed use of innodb and myism tables and to take full advantage of its caching capabilities. Non Persistent Storage is utilized for data that does not need to be maintained between reboots such as /tmp. This storage is much faster than normal local disks and allows substantial performance gains for short lived storage. Eaccelerator php accelerator and optimizer compiled into our custom php build. Keepalives, etags and other standard web server optimizations. Content Distribution Network (CDN) services and configuration are can be enabled for all managed Magento hosting offerings. Security - Individual server software firewalls to restrict outbound access. Environment edge firewall to seperate servers from each other and the internet. Suhosin hardened php, an advanced protection system for php installations designed to protect servers and users from known and unknown flaws in php applications and the php core. Remote administration can be limited to a secure VPN. Connections into your backend can be routed over a site to site VPN. Backups GPG encrypted before storage. Unnecessary services have been disabled and potentially dangerous system tools removed. Reliability - Multi-server, multi-tier architecture with multiple, load balanced application servers so the failure of a server will not effect your clients. By using managed Magento hosting you get all the benefits while our engineers deal with the complexity With the flexibility of the cloud a new instance can be started up in minutes, never having to wait for replacement hardware or physical intervention. 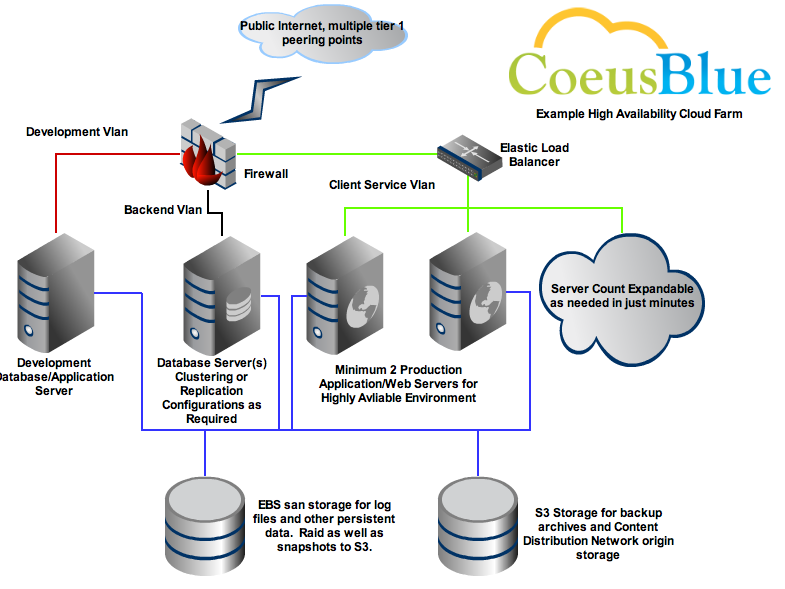 Database and log file backups to multiple regions. The boot time deployment process ensures your application code is available to new instances starting in any region. Standard data retention is 30 days but can be extended to any duration for only pennies per gigabyte used. Service Guarantees greater then 99% greatly surpass the competition. Some providers offer claims of 99.999% uptime, but only cover hardware failures. At Coeus Blue when we guarantee your site will be up, we mean it will be serving your content to your users. Our engineers will work around the clock to restore your site to the state it was in before a system failure, not just put in a new hard drive. Magento and Magento Enterprise are well suited to use our mid sized farm as a starting point. Magento works well in a 2 tier architecture such as this, but a CDN service is recommended for image heavy commerce sites. As the traffic levels of the site grow, the number of application servers is increased. Eventually a second database server will need to be added to allow for additional application servers. This software stack optimized for Magento makes an excellent platform for many other LAMP (Linux Apache MySQL php) software such as Joomla, and Wordpress.